There are only another five or eight studios in which I spent enough time to retain vivid memories, notably, Quad, Hip Pocket/Blank Tapes, Clinton and The Village, but I’m nearing the end of my tale and I thought I’d save some personally important studios for the last few entries. LA East sits on the outer edge of what you would call the downtown area of Salt Lake City. It’s mostly a residential neighborhood but the train tracks from the west run right though it. There are some businesses but it’s not exactly the hub of the city. 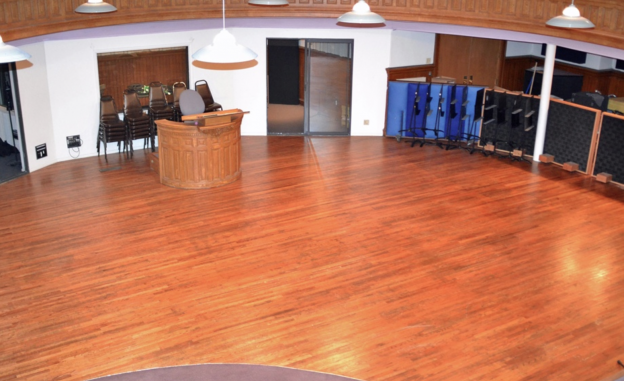 The building is a converted church and the old sanctuary serves as the larger of the two recording spaces. The main studio and control room were designed and built by Tom Hidley from Westlake Audio in L. A., thus the name… These two areas of the facility are separated by a series of small control rooms, edit bays and offices; it appears that no inch of real estate goes unused. The building also houses the main production music arm of Warner Chappell. I believe this means the studio is now semi-private and used only by this music house. Too bad, it’s a cool place to work, but I completely understand the desire for a permanent lockout on a facility. It makes it very easy to work quickly and focus on the music when the facility is no longer a variable in the equation. As the musicians arrived and the set-up was finalized, I remember that my head was spinning. Everywhere I went, there was a musician quickly and quietly running through a section of my score. It was like hearing my inner thoughts floating all around the building in hushed two-bar phrases. Every time I made eye contact with someone, they asked me a question about the sheet music or a microphone or the recording order. At one point, two viola players stopped me to point out that I had created parallel fourths in one section of their parts (this is generally not done in orchestral writing). It was correct, everyone in the orchestra had them at that moment, I was using it for effect, but I must have looked like a deer in headlights. I remember understanding the question but being totally unable to defend the creative decision. Why would I have done that!?!?! They might as well have been asking me questions about space flight or brain surgery (in a nod to the now-gone but brilliant Mercenary Audio, “It Ain’t Rocket Surgery”, at least it’s not supposed to be). This chaos in my head was created by the session preparations that would become second nature to me in the years to come, but the first time, it’s pretty intense. As the scattered musicians found their seats, the fragments of the score ceased to fill the air. This was the calm before the storm. Between the musicians and engineers and runners and assistants and of course, the camera crew, there were well over 100 people involved. I took a seat behind the conductor and listened to the first run through. The piece was “Open” from 75 Seasons and it was a tragic mess. It’s a difficult track to start with and the first read of any session is generally awful. The headphones aren’t quite right, the musicians haven’t heard any of the material and are unaware of the feel of the score, there are too many little issues and it makes for a very rough realization of the music that will eventually emerge. However, to my ears, that day, the first time I heard a full orchestra playing my music, it was the most beautiful thing I had ever heard. When they finished, I could barely speak. I could feel tears welling up in my eyes. This vast army was gathered here to bring my music to life and it was going to work! There was a long, pregnant silence before it slowly started to dawn on me that every single one of those 100+ souls was waiting for me to react. As the morning turned to afternoon and the first day of recording slowly slipped into history, a very frightening thought began to form in my mind. I was spending many thousands of dollars per hour, the recording time was nearly one-third gone and I had nothing to show for it. A great brass take would have timing issues in the strings or a perfect string take would have a huge brass split at the crucial moment. I had some pieces I could edit together but many of those lacked real emotion and passion. It was starting to slip away. The frustration of playing pieces multiple times was taking its toll in the room as well. The string players were getting frustrated, the brass players were starting to make snarky comments about the conductor, the conductor was getting pissed at everyone… This was not good! By this point, I had taken up residence in the control room. From there, I could hear everything well and make quick judgments about what would work and what wouldn’t. I was speaking directly into the conductor’s headphones and he was relating the feedback to the orchestra. I could now see that this was not working. He was being blamed for my comments and it got quite heated between the conductor and the brass section. So I went into some sort of empathic, Ouija board mode and channeled the combined souls of Knute Rockne and Alfred Newman. I marched out to the podium and gave a speech about how I was to blame for the comments, how I knew how good they could sound and wouldn’t accept anything short of their best and it was for the good of their reputation that I was being such a perfectionist jerk. I don’t think I spoke for more than a minute or two but I do recall that I was very passionate and I remember that I got a rousing ovation from the strings and woodwinds. When I reentered the control room, feeling somewhat faint, I was greeted by the film’s director and producer, Phil Tuckett, and Steve Sabol as well. I assume if you’re reading this that Steve’s name is quite familiar to you. If not, it would take far too much time for me to explain how important a man he was in this particular situation, sorry. Anyway, they had arrived just in time to hear my “pep talk”. In poker parlance, I was now “all in”. The boss and the boss’s boss knew exactly what was happening. It’s kind of funny how a career can come down to a single moment but in many ways the next take would decide my fate. The session turned around immediately. We had three pieces in the can by the end of the day and the score went on to win an Emmy award and become some of NFL Films’ (let alone my) most identifiable music. It was a complete success.